Browned Butter French Breakfast Muffins. Don’t you just love when you find a simple recipe that calls for very basic ingredients yet it turns out full of flavor and unbelievably delicious? 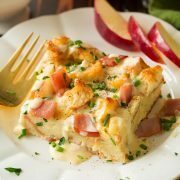 This is one of those recipes. These are easy, and minus the wait time for the brown butter to cool they are very quick to prepare. This is one of those mixing bowl and wooden spoon recipes. I’m kind of nervous I’ve finally tried french breakfast muffins because with the browned butter addition they are seriously one of the best breakfast treats ever! 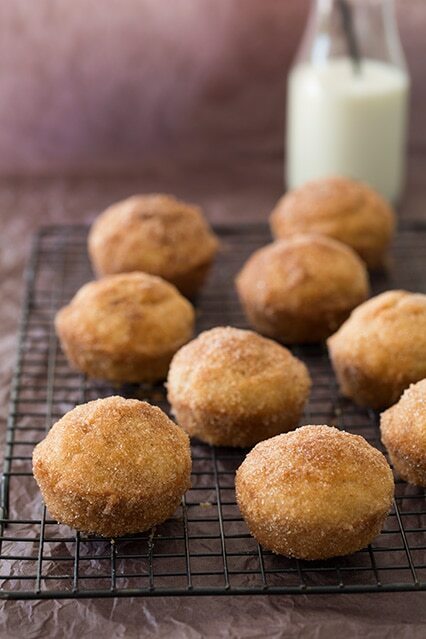 Their fluffy centers are soft and crumbly while their outsides are almost seemingly crisp yet they melt away since they are drenched in browned butter, then to finish it off there’s that generous coating of delicious cinnamon sugar that none of us can seem to get enough of. 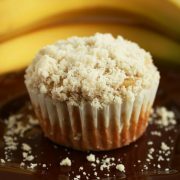 Without a doubt these muffins are love at first bite. Good luck saving some for the rest of your friends and family :). I guess it’s a good thing the batch only ended up making ten instead of a full dozen. Yes again, I will admit to my browned butter addiction. If you don’t yet have this addiction – please do manage to pick it up :). If it weren’t so bad for me I’d drink the stuff as if it were a protein shake. This is my first time trying french breakfast muffins and I thought browned butter would only make them that much better, and even though I’ve never tried the original variation I’m quite certain I’ll never want to; now that I’ve had them this way. With this recipe you will likely have an extra tablespoon of the browned butter left (after dipping) and about the same amount of cinnamon sugar, so either sit there and sip it by the spoonful while no one is looking or hold your head high and show no shame and just drink it right from the bowl. I’m only joking, save it for your oatmeal the following morning because unfortunately these muffins you made will most definitely be long gone by then. Enjoy! 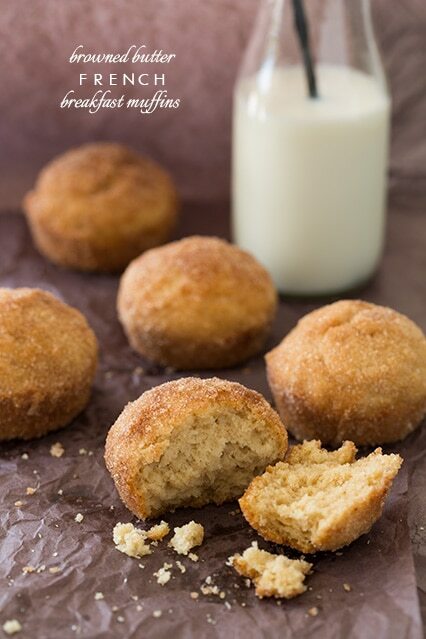 A delicious breakfast treat that's filled with tempting browned butter and cinnamon flavors. Brown 6 Tbsp unsalted butter in a small saucepan over medium heat, swirling pan occasionally until perfectly browned (butter will melt, then splatter, than foam, then bubbles will become golden then little brown flecks will appear in center of foamy bubbles - usually let it spread 2 inches then immediately remove from heat and pour into a heat proof dish). Set butter aside to cool 25 minutes, or until lukewarm. Heat oven to 375 degrees. Butter 10 cups in a 12 cup muffin tin and dust lightly with flour, then shake off excess flour. In a mixing bowl whisk together, flour, baking powder, salt, 1/4 tsp cinnamon and nutmeg for 30 seconds, set aside. In a separate mixing bowl whisk together 1/4 cup + 2 Tbsp granulated sugar and light brown sugar until no clumps of brown sugar remain. Using a spoon, stir in cooled browned butter. Add in egg and vanilla and mix until well blended. Stir in milk. Make a well in dry mixture and pour wet mixture into well in dry mixture. Fold mixture just until combined (batter will be slightly lumpy). 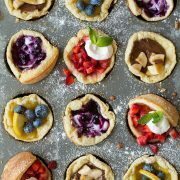 Divide mixture evenly among 10 prepared cups in muffin tin. Bake in preheated oven until toothpick inserted into center comes out clean, about 15 - 17 minutes. Remove from oven and drop muffins onto a cooling rack. Allow to cool just until cool enough to handle. While muffins are baking, brown 1/2 cup butter in a small saucepan. Remove from heat and pour into a heat proof bowl and allow to cool slightly. In a separate bowl whisk together 1/2 cup granulated sugar and 1 tsp cinnamon. Whisk browned butter then dip and roll each muffin into browned butter to evenly coat entire muffin, then transfer to cinnamon sugar mixture and roll to evenly coat. Serve warm. Store in an airtight container at room temperature. Catherine: Another winner! I made these this morning for my daughter’s playdate, and they were easy to whip up, even with 2 pre-schoolers and an infant running/crawling around. The little girls and the moms loved them! The browned butter flavor is perfect.